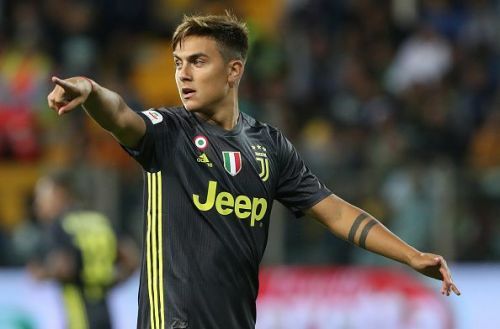 Juventus prodigy Paulo Dybala is reportedly being targeted by Jose Mourinho, according to Calciomercato. The 24-year-old recently signed a new 5-year contract for Juventus worth €120,000 a week, that is designed to keep him at the Italian champions until 2023. In spite of this, heavy speculation has begun to mount as United have emerged as favourites to land the Argentinian forward in the January transfer window. Juventus' frontman Paulo Dybala is beginning to be considered as one of the most talented and exciting forwards in the world, after producing some astonishing performances in Turin for the last 2 years. Since signing for the Italians back in 2015, Dybala has made 100 appearances for the club scoring 52 times. He performed particularly well in Juventus' run to the Champions League final in 2017, where they were beaten by holders Real Madrid. Dybala has also played 13 times for Argentina, and at 24-years-old, looks to become the natural successor of Lionel Messi in the national side. It has come as no shock that heavyweight teams such as United have become interested in the striker, as they look to improve their attacking options. Still a young player, Dybala has a massive potential to improve and he has already shown in the Champions League that he is able to play well at the highest level. At Manchester United, he would be playing with heavyweight forwards such as Alexis Sanchez and Romelu Lukaku, which would make them serious contenders in the race for the Premier League title if these players were to perform well in the big games against other top 6 teams. Manager Jose Mourinho has moaned in classic style about the failings of his attacking options at Manchester United and is not a man known to give second chances if a player doesn't come up with the goods for his team. The deal would not be cheap, however, with the Argentine valued at £107m, or €120m. There are several reasons that attract Manchester United to signing the forward, but with Juventus reluctant to sell and the massive price tag attached to the player, it may be difficult for the deal to go through in January. There are several reasons for both the club and the player to make a move but the credibility of the reports still remain in speculation. With the Red Devils making a poor start to the season, it will be no surprise to see Mourinho moving to sign Dybala in January.